In small bowl, beat all dressing ingredients with wire whisk until well mixed. Meanwhile, cook soybeans as directed on package. Rinse with cold water; drain. 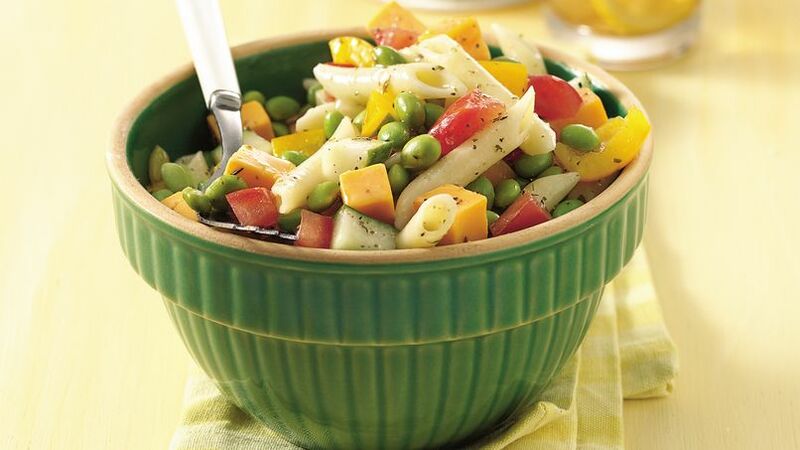 In large bowl, toss pasta, soybeans, remaining salad ingredients and dressing. Cover and refrigerate at least 1 hour before serving. Edamame is the Japanese name for fresh green soybeans, tasty little, bright green gems that are high in protein and easily digested. The soybeans are picked before they are completely mature and are often sold in their fuzzy green pods. Fresh edamame is available spring through fall in raw or ready-to-eat forms at co-ops, natural-foods stores or large supermarkets. Raw beans should be steamed 20 minutes before eating and are usually served chilled. They’re also available frozen in boxes or bags. Once cooked, edamame can be served right in the pods as a fun appetizer or snack, and it can be shelled and used in salads or other cold or hot side dishes.